In an age when students come to class with more varied music listening preferences and experiences than ever before, music educators can find themselves at a loss for how to connect with their students. 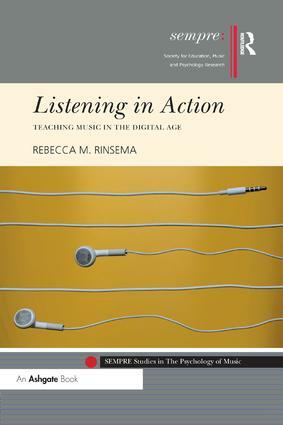 Listening in Action provides the beginnings of a solution to this problem by characterizing students’ contemporary music listening experiences as they are mediated by digital technologies. Several components of contemporary music listening experiences are described, including: the relationship between music listening experiences and listener engagements with other activities; listener agency in creating playlists and listening experiences as a whole; and the development of adolescent identities as related to the agency afforded by music listening devices. The book provides an accessible introduction to scholarship on music listening across the disciplines of musicology, ethnomusicology, sociology of music, psychology of music, and music education. By reading Listening in Action, music educators can gain an understanding of recent theories of music listening in everyday life and how those theories might be applied to bridge the gap between music pedagogies and students who encounter music in a heavily mediated, postperformance world. Rebecca Rinsema is Lecturer of Music in General Studies at Northern Arizona University, USA. She teaches courses on popular music and the analysis of music from the listener’s perspective. She is also a singer specializing in the performance of early music.